FIFA U-17 World Cup News: Desi Gurgoan Boys to US Based NRI, All Joining Forces in India’s Preparation for 2017 FIFA U-17 World Cup. U-17 FIFA World Cup which will be played and organised in India. The matches will be in Delhi, Kolkatta and Mumbai. In this U-17 team, the team members are from different states. 2 Kids are from Gurugram. Their names are Mohit Gehlot and Bhupender. They are from Vedas International School. They hail from good families. Mohit father is a Subedar in Army while Bhupinder father is a farmer. 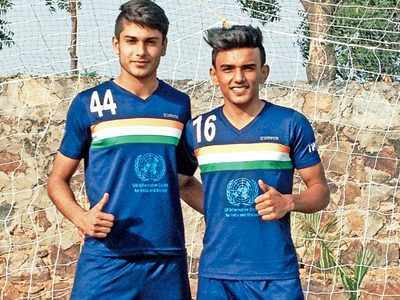 At present these both boys are in Europe for the Pre-World Cup exposure. It is their first venture to International. They both played domestic matches. Their School is proud to have them in in FIFA World Cup. Bhupender is a Class 12th Student and Mohit is in Class 11th. Both are very excited to play for their country in October this year. This coming up match will be good advantages for Indian Kids who will be the part of it, they can fulfill their dreams. They both are busy in practice matches. Namit Deshpande, a US-based NRI, he is selected by AIFF though it’s overseas scouting portal for U-17 World Cup Tournament. The AIFF received around 50 applicants who applied for this tournament. They have uploaded their videos so that selectors eyes catch their glimpse. In all of them, the luckiest one is Deshpande. He is the son of New Jersey-based architects and originally he is from Mumbai.